Are rust and corrosion creating customer-retention problems for your company? Can you pinpoint the cause of the corrosion? Is it shipping? Is it storage? Green Packaging solves complex corrosion and rust problems once and for all with our line of environmentally friendly anti-corrosion packaging. VCI products are coated with rust-inhibiting chemicals. The chemicals work on a molecular level to completely cover the surface of metal parts, both small and large, preventing oxygen and moisture from causing corrosion and rust. Best of all, VCI packaging products excel in the contact and vapor phase for protection against corrosion, regardless of whether the metal is in direct contact with or close proximity to the VCI product. Metals have unique characteristics. They come in different sizes, shapes and weights. And they require different forms of corrosion protection, which is why we carry a line of VCI products proven to prevent rust and corrosion on all types of metals and alloys. Opt for one method or combine multiple packaging products for ultimate metal parts protection. 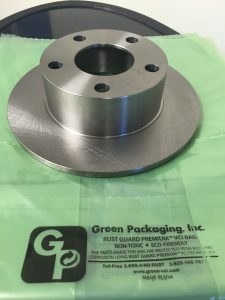 Green Packaging’s inventory of anti-corrosion packaging products provides customers with an unmatched selection of rust-prevention methods. With more items and sizes in stock than any other distributor, you never have to worry about not getting what you need immediately. Even if you are waiting on a custom-sized VCI product order, Green Packaging still provides you with one of our hundreds of stock VCI products to keep you covered while you wait. Green Packaging monitors your inventory of VCI products to ensure that you never run out of VCI paper, bags or any other packaging product. Green Packaging will design a custom packaging program for you and stock your custom-sized VCI products at no extra charge. This way, you never have to wait for your custom products again. Your VCI products are constantly stocked and supplied (even specialty-sized bags). Returning customers receive low-inventory alerts when you’re running low on products.